Ohhhh Mimi! I loved this so much! The Librarian's Vampire Assistant book 2 finds Michael pretty much where we left off, still looking for answers in his maker's death, the reason for the new vampire making parties, who else is selling ancient vampire blood to make new vampires to the highest bidder, all while trying to keep his precious little librarian safe from herself and the vampires who have decided she must either join them or die for what she knows. Unfortunately for our unlucky librarian Miriam, she knows NOTHING thanks to the copious amounts of drugs that were in her system when she watched her boyfriend, Jeremy and Mr. Aspen get dusted. She literally thinks she imagined the whole thing but Michael can't convince the council of her ignorance so he needs to find a creative way to get her out of her "sentence" of death or life as a vampire without her finding out the truth and maintaining her humanity. 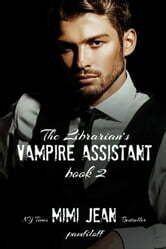 Michael gets to the bottom of Clive's murder and is betrayed by the most unlikely of people in the newest installment of Mimi Jean Pamfiloff's cozy vampire mystery series, The Librarian's Vampire Assistant book 2! Another fun page turner read! Often when you have a sequel it’s just never as good as the original… That is definitely NOT the case here. The Librarian’s Vampire Assistant 2 is just as good if not better than the first. Our quirky 400 year old gentleman Vampire with very particular tastes. He likes his life of peace, order, extra spicy Indian food, coffee, and the more reasonable climate of Ohio. He certainly doesn’t need ¬¬¬Arizona’s excessive sunshine, 500 missing rogue vampires or the quirky librarian that is taking up way to much of his attention. With the mystery of who killed Michael’s maker and oldest friend solved you would think that he would be happy. Oh no, there are 2 territories thousands of miles apart to oversee, vampires to hunt down. Not to mention the ultimatum given over “his” accident prone trouble magnet librarian whom he has spent way too much time trying to keep alive. Mimi Jean has successfully given us a fresh take on traditional vampire lore, finding new ways to bring her creativity and flare for snarky yet lovable characters to what is still a new genre for her. She finds new and inventive ways to torture her beloved characters and by result her loyal readers. If I didn’t find myself deriving so much enjoyment from Mimi’s twisted mind I might be inclined report her for the need of professional help. She can be absolutely devious and I love every word of it. I loved it and can’t wait for the next book. What a cliff hanger! At the end of book 1, Michael was tasked with taking over two societies (territories) and finding the 500 newborn vampires and dispatching of them. While doing this, he still feels a pull to the human librarian, Miriam and trying to keep her safe and still human. The author did a good job of repeating just enough material from book 1 so that this book could be a standalone, however, I recommend reading in order. I find that the more I read about characters, the more I care about them and what happens to them. I was a bit surprised with book 1. I believed it was a paranormal romance but learned it was more of a paranormal mystery book with just a touch of romance. Personally I want more romance, but since I went into book 2 with this knowledge, I enjoyed this book so much more. This has the silly humor that will make you laugh out loud. I also think this book was just overall funnier than the first one. There were a lot of crazy things going on that kept me pretty entertained and the side characters were more fleshed out. While the mystery was solved for book 2, this did end on a new mystery that will lead us into the next book. There was a small amount of movement in the romance and I hope we get to see more. I love this book. Some books just beg to be read again and again. This is one of those books. And I cannot wait for number three. Michael is the sexiest character I have ever read. I just donnot have enough words. Wow just wow.